On March 14, 1968, Dr. Martin Luther King Jr., speaking at Grosse Point High School in suburban Detroit, described “two Americas.” The citizens of the beautiful version of America “have the milk of prosperity and the honey of equality flowing before them.” They have “food and material necessities for their bodies, culture and education for their minds, freedom and human dignity for their spirits.” But, King warned, there was another America, one in which segregation and discrimination compelled African Americans to “walk the streets in search for jobs that do not exist” and “live in vermin-filled, distressing housing conditions.” In this other America, black children were relegated to overcrowded, underfunded schools that remained segregated despite the Supreme Court’s decision in Brown vs. Board of Education fourteen years earlier. King reiterated his commitment to non-violence, but refused to condemn the riots that had shaken American cities each summer since 1964. King told his audience that “a riot is the language of the unheard” spoken by those left “with no other alternative” but “violent rebellions” to draw attention to injustice and inhumanity. It would be “morally irresponsible” to refuse to listen. Three weeks later, on April 4, 1968, while King was in Memphis to support the city’s striking sanitation workers, King fell to an assassin’s bullet. That night, riots erupted in over 100 cities across the nation in grief over King’s murder, and in anger at being relegated to that “other America,” in neighborhoods ravaged by disinvestment and deindustrialization.The riots in Washington, DC raged for five days and were only quelled when President Lyndon B. Johnson mobilized nearly 14,000 federal troops. As the smell of smoke drifted across the National Mall, among those willing to listen was Smithsonian Secretary S. Dillon Ripley and John Kinard, the institution’s first black museum director. Two years before the riots, Ripley had grown concerned that, while attendance at the museums on the Mall was robust, very few black faces could be seen in the crowds there. 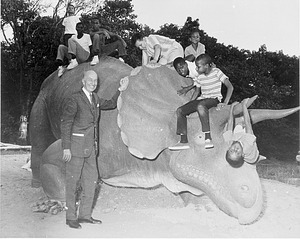 In 1967, he decided to establish the Anacostia Neighborhood Museum in Southeast DC. Ripley hoped that bringing the Smithsonian to Anacostia would also bring black Anacostians to the museums on the Mall. He then recruited Kinard to run the museum, empowering a talented and well-known community organizer whose vision for the new museum would radically challenge the relationship between the Smithsonian’s museums and the communities they served. When the Anacostia Neighborhood Museum opened in 1967, its exhibits were not focused explicitly on African American history. 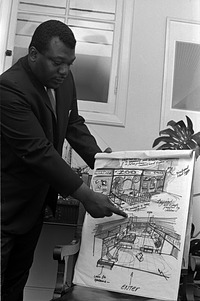 However, the riots that followed in the wake of King’s assassination, inspired Kinard and his staff to make “Anacostia [into] a full-fledged museum that would highlight and address issues germane to black people, and particularly their history.” Significantly, they also decided that the community would determine what to put in the museum. What resulted was a remarkable series of exhibitions that focused on the issues and problems the community had long faced: mass incarceration, pollution, unemployment. They also mounted exhibitions featuring the history of Anacostia and famous residents like black abolitionist Frederick Douglass. This was something new for the Smithsonian. Though earlier exhibitions had featured African American culture and history, none had done so in such a focused and sustained way. In the aftermath of the 1968 riots, when the Smithsonian debated whether to restrict access to the museums on the Mall, they rejected this option. That they instead opted to make the Smithsonian more accessible is testament to Secretary Ripley’s commitment to democratic Smithsonian and Kinard’s commitment to black life and culture. Explore more than 150 years of African American history at the Smithsonian Institution by visiting African American Contributions to the Smithsonian: Challenges and Achievements.